I hadn’t suspected the otherworldly limestone Karst country we’d crossed en route from the Visitor Centre to the Cutta Cutta Caves entrance to be a portal to a parallel universe. But had we inadvertently stumbled into a casting call for a bad B-grade movie? For now, waiting for our guide at the stairs leading down to the locked entry gate were an older couple (not us!!!) hung about with a ballast of camera equipment; a bickering honeymoon couple resplendent in ‘resort’ gear; two tanned and muscular young men travelling together in some ambiguous capacity; a young family with two hyperactive sons; and us. Or was this demographically diverse group tailor made for the kind of film where an unknown threat would pick us off one by one?? Maybe I was just being paranoid. Or ‘going troppo’ as they say in northern Australia’s Top End! But then we met our guide. Materialising through the shimmering heat waves of the limestone formations between the Visitor Centre and the cave entrance, Nathan* – complete with an increasingly macabre dry wit – was a gift from B-grade schlock-horror central casting. Brandishing an oversized key, he unlocked the gate and led us through. Then, with a clang, it slammed shut behind us and he padlocked the steel mesh frame securely, gesturing us down into the gloom below. Padlocked? What could we possibly need protection from down there?? As we descended into the depths, ducking to avoid being knocked out on the sometimes low roof, Nathan entertained us by pointing out potential catastrophes along the narrow track that wound between the sometimes spectacular limestone formations, stalactites and stalagmites. But the plot was starting to sound horribly familiar. I think I knew how this story ended – and it didn’t end well for me. 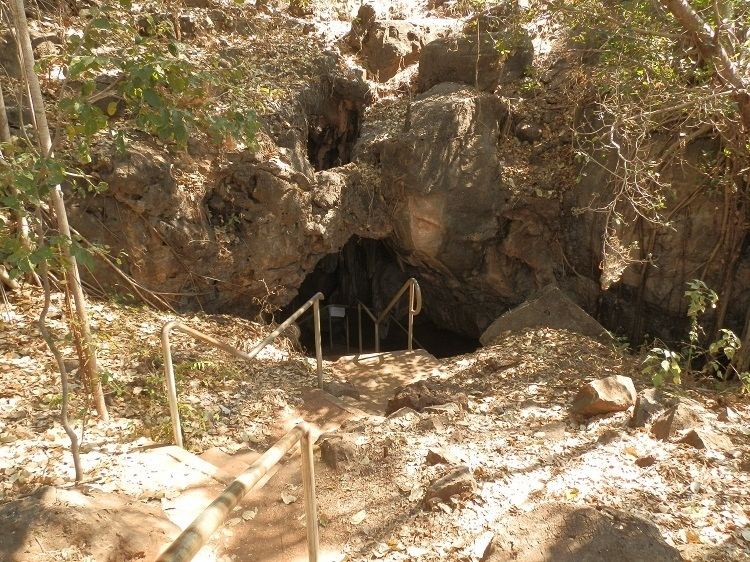 The Cutta Cutta Caves Nature Park, a popular Katherine attraction and billed as the Northern Territory’s ONLY publicly accessible tropical limestone cave, is a mere 27 km out of town. However, it generally takes second billing to the far better known Nitmiluk National Park, aka Katherine Gorge. During the Australian winter when it’s peak tourist season in the Northern Territory, Park rangers conduct regular tours through the caves. Arriving without a booking, we’d lucked out – or so we thought – by being assigned to Nathan’s tour. He was certainly holding our interest with his ghoulish wisecracks. So much so I’d forgotten to watch for the rare ghost and horseshoe bats found in the caves. I hadn’t forgotten about the brown tree snakes, however, despite their ‘harmless’ status. But so far they hadn’t shown themselves. Result! A little further along Nathan told us how early in the 1990’s the non-indigenous stockman who found the caves while searching for missing stock named them ‘Smith’s Caves’ – after … wait for it … himself! Who would have thought? A death-trap for wandering creatures who fell through the roof to become trapped in the caverns below, the cave now held a different kind of prey captive. ‘Who knows what might fall through next?’ Nathan wondered aloud, exaggeratedly glancing above to the cracked roof followed by anxious glances from the group. If nothing else, his macabre machinations was proving a fairly effective cure for hyperactivity as the children fell silent at last. We admired the glittering limestone before nearing the end of the accessible part of the caves. How trustingly we’d let Nathan lure guide us into the cave! Now he had total control of the light switch. AND the only torch! ‘I’m going to turn out the lights to let you experience total darkness,’ Nathan said as he flipped the switch, plunging us into an all-enveloping blackness so deep and intense my skin seemed to be absorbing it. ‘Did you know that people can go mad after half an hour in complete darkness to which your eyes will NEVER adjust?’ Nathan’s voice spoke helpfully into the void. I felt a restless stirring in the group. ‘Because you start thinking about falling into a deeper hole.’ He paused to let the idea take hold. ‘Or about the snakes, spiders and bats.’ Pause. Was that something touching my foot?? My eyes tried again – and again failed – to adapt to the all-consuming blackness. ‘Or that perhaps you’ll never get out.’ Longer pause. That B-grade film plot now on endless replay through my mind was starting to seem a bit more realistic. And not just to me! Around me, the complete darkness filled with total silence. I smacked down the ‘what if’ thoughts I was starting to have. How embarrassing would it be to be the first to go completely mad in the darkness? After only a few minutes?? Although aware of them, the caves apparently had no cultural significance for the local Indigenous people, the Jarwoyn and played no part in their rituals. But maybe that’s because this ghoulish grotto had gotten old real quick. It can’t have been any fun underground in pitch blackness with no electricity. Then, without warning Nathan switched the lights back on, leaving a startled group exchanging sheepish glances with each other. He directed us back along the path towards the entrance, bringing up the rear as I stopped to take photos. ‘Has anyone ever freaked out in the total darkness?’ I asked. ‘I think she appreciated my sense of humour,’ said Nathan. But as my (of course) unwarranted fears vanished in the cold, hard, natural light of day, I too was left with an abiding appreciation of Nathan’s dark arts. His unique and refreshing departure from the usual – and sometimes dreary – delivery of facts and information made a memorable experience that only extreme age and/or an attack of amnesia could make me forget! And as we returned along the path to the Visitor Centre, I enjoyed a cruel laugh as the next victims tour group picked its way through the Karst to keep their date with the Ghoulish Guide of Cutta Cutta Caves! « 1000 Words About … Solitude! @Cathy – There’s no shame in NOT giggling!!! Plenty more wonders and delights to come from downunder in 2013! @Filip – You’re right – it’s impossible to re-create the total darkness and eerie feeling underground! @LONDONLULU – Haha, you’re right – they DO go together!! @FruitCake – I guess that’s why I’m here … to let you ‘armchair test’ the experiences I’ve ‘road tested’!! @Are We There Yet – Haha, I’m not responsible for great pix, it’s the camera!!! @FrankieG – AAAHHH … if we’d had the snake experience on top of the Nathan experience, I don’t know if my nerves could have stood it!!! @PDP – Hysteria is the response I was aiming for, so I guess my work is done … I’m honoured my blog provided post-midnight entertainment for you! @Sallie – HAha, we’re just lucky – I guess!! @TMWH – Giggling hysterically beats the hell out of cackling maniacally or shrieking uncontrollably!! @SFlaGuy – HHHMMMmmm… actually can’t think of an actor with the right blend of normality, black humour and meanacing undercurrent to do Nathan justice!! @Linda – You’re right – the caves while interesting, were certainly not the most spectacular we’ve seen. But the whole experience ranks WAY high because of Nathan!! @George – Haha, who said it had a happy ending?!?!?! I don’t think the NEXT group’s been heard from for awhile …!!! @Linley – Haha, you’re right of course! An extraordinary guide like Nathan makes all the difference – and turns the moment into a real experience! @TFG – Thank you!! Plenty more downunder weirdness to come!! OMG maybe I’m a little hysterical myself, but I’m going with tired seeing as it’s after 12.30 here in Perth, that was so funny I had tears rolling down my face you crack me up..’a little paranoid’ you say hahaha! great post. I wish i would have seen these places when backpacking australia. I’m back to blogging though. Hi Red, we were there about 10 years ago. I cannot recall much about our guide or the limestone formations but I do remember the lights being turned off! (actually we have visited many caves throughout Oz and the guides always turn off the lights) but the cave highlight was the blind cave snake. It was an orange and white banded snake about a metre long and and thick as a broom handle. I have some badly focussed photos of the snake on a ledge inside the caves.In fact the guide went out of her way to find the snake for us. Loved the tour. How fun!! Caving is a great time. We went to a couple over the summer and really had a great time. Of course, I can’t take pictures like you do. 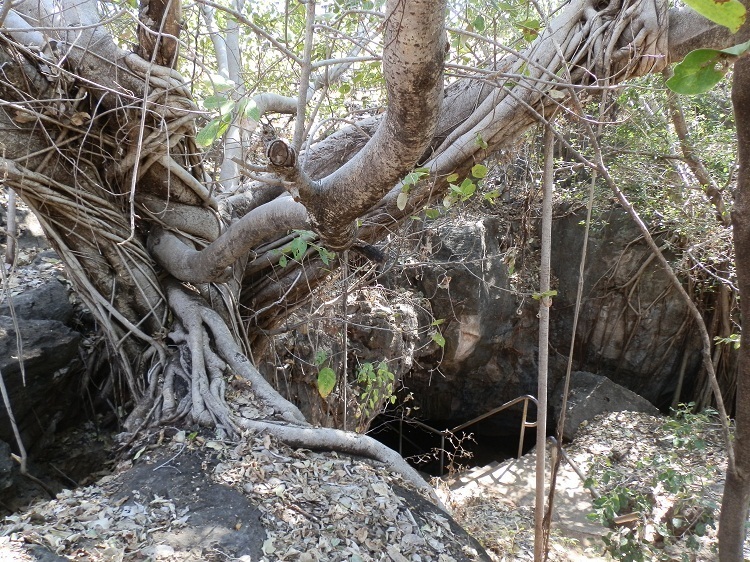 Never knew there were caves near Katherine. I did go into some caves once [Buchan caves]. If I ever went inside a cave again there are two things we could be certain of: firstly, I would have a pair of boltcutters with me, and secondly I would be unconscious cos that’s the only way someone would get me back into a cave. Your pictures are very good but it is alway difficult to give a real impression of how a cave looks on a photo. Oh, my, I´ve missed out on that, too! We´ve been to Katherine, twice even! How come? So sad! That sounds truly fascinating, and you made me laugh, too 🙂 Must´ve been quite an adventure. Guess with the dark, though, I might´ve been the one asking for light! I was once in an old asylum with two room-mates and one torch, no one knew how old the batteries were and it was getting dark. I’ve been on a couple of cave tours, but have never had a guide as ‘interesting’ as Nathan. I’m glad your B-movie had a happy ending. Amazing photos, OZ. You have shown me what a diverse and beautiful country Australia is and I hope to visit someday. I don’t know if I would venture down into the caves. Giggling probably wouldn’t be my response. You two never have an ordinary adventure do you? Even your tour groups are out of the ordinary. Nice cave photos too — I think it’s really hard to shoot good photos underground. Great photos of a fascinating place. Thank you for the post. I love caves. I’ve even crawled thru Monmouth Caves on the Wild Cave Tour. It’s a great story but not as vividly told as this one. I can’t wait for the movie. Oh, Red, this is the very best virtual adventure I have yet been on – every second, hanging onto every word, waiting and waiting and then reading a little more rapidly to the part where the…..unknown…. happens. Perhaps I read too much, but this was just simply a “LOVED THIS POST”, kinda post. 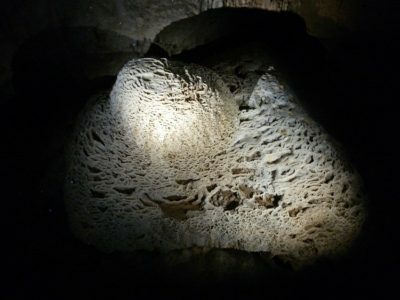 I seen the “cave” movies, read the novels and now have had the virtual tour. Thanks so much – did I already say I loved this post? That was a cave tour with a difference. Great shots of all the different formations. I’ve always said I love caves, now I may have to amend that and say I love the idea of caves, since I’ve never actually been in any. After seeing these beauties, I’m more keen than ever to see some in person, but what if I freak out in them? Do they have a spare guide to immediately return me to the surface? or would they say, it’s okay, just sit down here and breathe, stay calm, we’ll be back for you in an hour.